Since Basel 2011 when Rolex unveiled an updated version of the venerable Explorer II, there has been much written about the new(er), updated Rolex Explorer II model 216570. At its launch, the Explorer II was featured prominently in Rolex’s iOS iPad app and in stories fueled and supplied by National Geographic, a partner in the Rolex iOS app and accompanying analog paper catalog. Partnering with National Geographic seems natural as the Explorer II stands out as Rolex’s adventure watch because of the 24 hour bezel that can be felt / read by finger pressure, and the bright orange 24 hour hand –now brighter and more visible in the updated version. The all-stainless bezel and the orange 24 hour hand make the Rolex Explorer II entirely cool. Another standout feature is that unlike many other Rolex sport watches, there is no two-tone, gold, or platinum version. The Explorer II has always been intended to be a bold and durable adventure watch through-and-through with no gold or diamond distractions. The Explorer II was designed with a 24 hour hand used to track another timezone, or to read local time using military / European time using a 24 hour scale rather a 12 hour scale utilizing AM and PM. Like older 3185 movement, the newer 3187 movement allows for an independently set 12 hour hand. Initially, the Explorer II’s 24 hour hand was intended for cave dwellers to discern whether it was 0700 in the AM or 1900 in the PM and the reason for the bright orange 24 hour hand. Additionally, the 24 hour hand was automatically set to local time and when outside, the 24 hour hand will point North when the 12 hour hand was pointed to the sun (Northern Hemisphere only; look at watch overhead for the Southern Hemisphere). 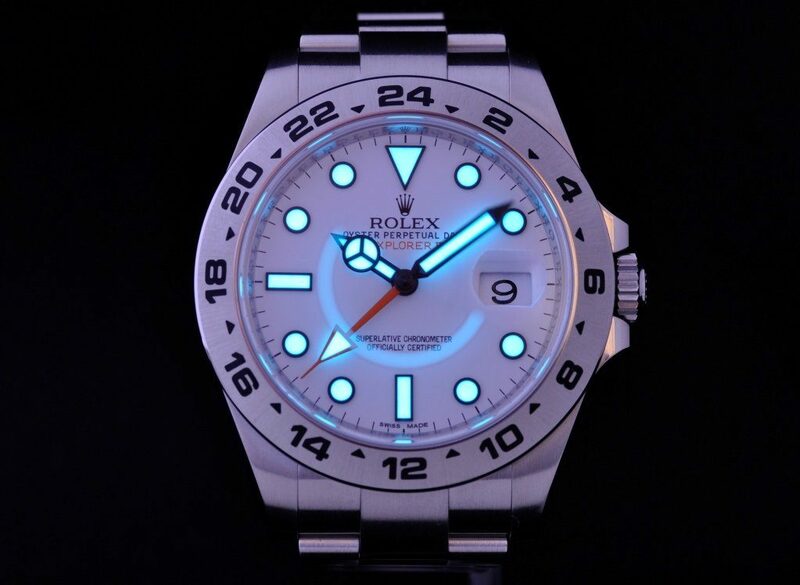 The new Explorer II 216570 utilizes a larger case and watch face increasing from 40mm to 42mm, larger hands filled with Rolex’s new Chromolite lume, Rolex’s proprietary in-house ParaFlex shock mechanism, and Rolex’s updated solid linked Oyster bracelet and clasp with the EasyLink system to quickly adjust the band ½ link. These revision are welcomed and the size increase brings the watch into the 21st century and is much easier to read. Unlike other watch brands that increase the size of their watches, Rolex made the 3187 base plate larger filling the entire interior of the watch case, and made the date wheel bigger such that the date is in the same location (just a mm) from the edge of the watch face. Other brands keep the movement size, and date wheel the same diameter, and have more dead / wasted space between the date wheel and the edge of the watch face. Without question, the new Explorer II wears like an adventure watch. The watch is slightly heavier than its predecessor, is similar in weight as the Rolex GMT Master II 116710, and the larger case and face make it stand out. Fortunately, the bracelet and case are designed proportionate to each other, and the watch case lugs taper into the bracelet like traditional Rolexes do. There is no box shape to the watch head like the updated Submariner and GMT. Subsequently, the watch is easy to look at and easy to wear. The watch is the same 12mm in height so it is not top heavy like some of the diving / yachting watches. The new Explorer II fits well, even on smaller diameter wrists because it is only 12mm in height. The EZ-link located in the clasp helps for when wrists expand in the heat, or to loosen the watch when worn under cuffs. 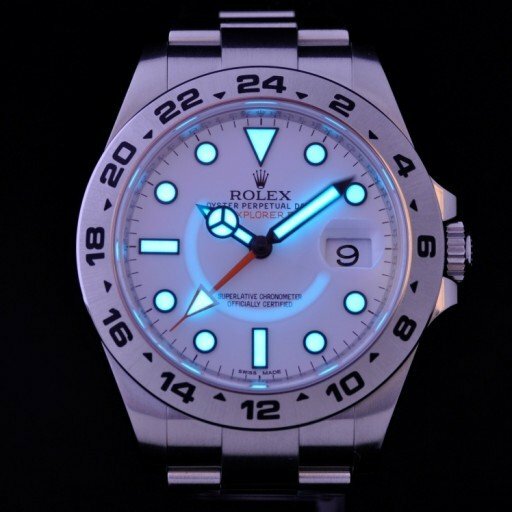 The Chromolite lume on the dial dots and hands stays bright all night and the blue is a pleasing color unlike the SuperLuminova light guacamole green that Rolex uses in its older models. Without question, the Rolex 216570 Explorer II is one of the best wearing sport / professional watches in the Rolex line.